Early Dutch settlements gave rise to what is now New York City, and the names of several features in the area are reminders of this heritage. Just off the northern tip of Staten Island, a small ridge of sand was named Robyn’s Rift, meaning seal’s reef, as the animals were frequently found lounging there. This Dutch name was later Anglicized to Robbin’s Reef, or now more commonly Robbins Reef. 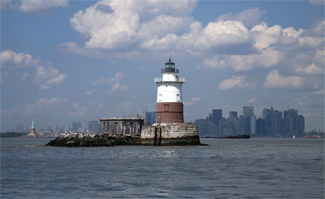 The reef is situated near the entrance to Kill van Kull (Kill is Dutch for water channel), a three-mile-long waterway linking Upper New York Bay to Newark Bay, home of the busiest port in the eastern United States. 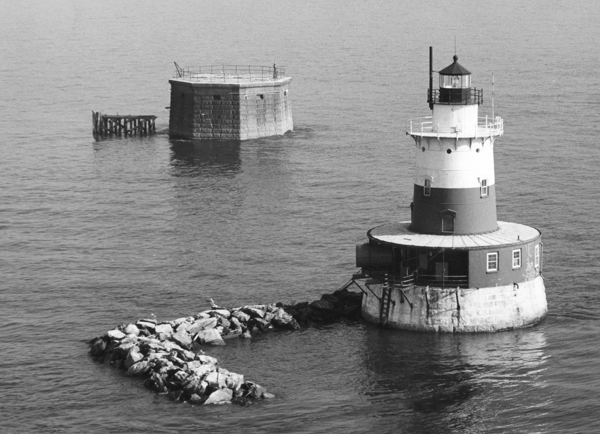 Robbins Reef Lighthouse in 1917. Note fog bell, foghorn, and open gallery. 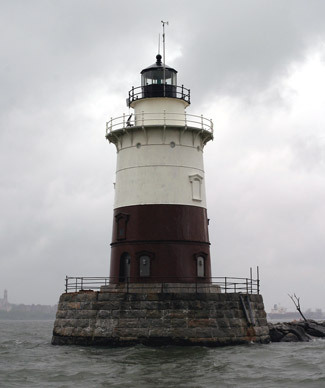 For Robbin’s reef, which is seen from the city of New York, I was desirous of having a light-house both durable and handsome; the foundation being in water which rose and fell with the tide some eight or ten feet, and exposed in the winter season to floating ice, it was found necessary to form it of granite, forty-eight feet diameter, with an elevation of eighteen feet; upon this the tower will be placed, of the octagon form, built of hewn granite, with accommodations in the different stories for the keeper and his family. A contract has been entered into for erecting the building upon this plan, and with this material, for the sum of thirty-four thousand nine hundred dollars; and for fitting up the same, six hundred and eighty dollars; the work to be completed by the middle of October, 1838. 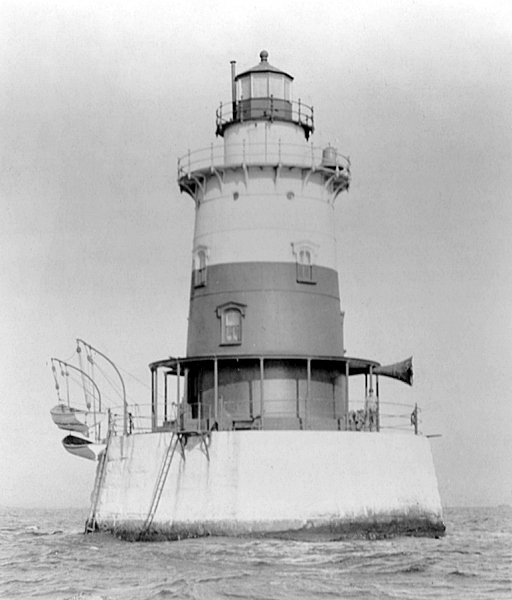 The octagonal lighthouse contained a wooden circular staircase that provided access to the various levels of the tower and a ladder that led to the lantern room from which a fixed white light, produced by fifteen lamps set in sixteen-inch reflectors, was displayed at a focal plane of sixty-six feet. Isaac Johnson, the light’s first keeper, first lit the array of lamps in 1839. The tower contained five rooms for the keeper and his family: a kitchen and sitting room on the first level, a bedroom on the second level, and two bedrooms on the third level. The fourth level of the tower was later used to house a mechanism for striking a bell that was hung on the northeast side of the tower, and a cistern located in the pier could store up to 1,270 gallons of rainwater for the occupants of the lighthouse. A fourth-order Fresnel lens was installed in the tower in 1855, replacing nine Argand lamps and the same number of twenty-one inch reflectors. 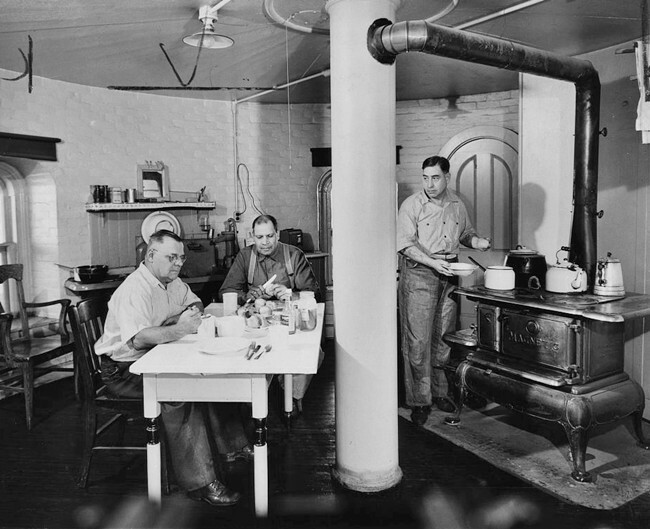 In 1875, the Lighthouse Board conducted experiments in the use of mineral oil at the lighthouse and then installed mineral-oil lamps in the lantern room and built a shed for storing the oil the following year. After the lighthouse had served mariners for just over four decades, its light was extinguished on March 10, 1883, and relief lightship LV 25 was anchored nearby to mark the reef while a construction crew living aboard dismantled the old tower and built a replacement. A temporary light was displayed from the mast of the lightship during the work. The light in the new tower was exhibited for the first time on July 10, 1883, and a decade later a blower siren replaced the station’s fog bell. For its first two years of operation, the siren was run by a Priestman engine powered by coal, but in 1896 a Hornsby-Akroyd oil engine was placed in operation. 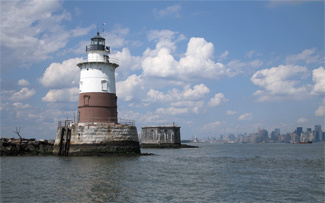 The most famous occupant of New York Harbor is surely Lady Liberty, who first struck her now permanent pose in 1886, just three years after the second Robbins Reef Lighthouse was built, but in the lighthouse community, Kate Walker, keeper of Robbins Reef Lighthouse for nearly thirty years, runs a close second to the torch-bearing statue that stands just over two miles north of the lighthouse. To gain an appreciation for Kate Walker, you have to travel back to northern Germany, where she was born Katherine Gortler in 1848. After finishing school, she married Jacob Kaird. The couple’s only child, also named Jacob, was only seven years old when his father died. Seeking a new life, Kate took Jacob to America, where she accepted a position waiting tables at a boarding house in Sandy Hook, New Jersey. It was here where she met John Walker, assistant keeper of the east beacon on Sandy Hook. Kate knew very little English and gladly accepted Walker’s offer of free English lessons. The student-teacher relationship quickly converted into a romantic one, and the two soon married. Kate enjoyed her life at the lighthouse, where there was land for her to grow vegetables and flowers, however, this life was short-lived as John was offered the position as keeper of the recently reconstructed Robbins Reef Lighthouse. “When I first came to Robbins Reef,” Kate recalled, “the sight of the water, which ever way I looked, made me lonesome. I refused to unpack my trunks at first, but gradually, a little at a time, I unpacked. After a while they were all unpacked and I stayed on.” John received an annual salary of $600. The couple, along with their son and new daughter Mary, quickly adjusted to their home with a 360-degree harbor view. Although Kate had capably served as assistant keeper, the position of head keeper was only offered to her after two men had turned down it down. Perhaps the Lighthouse Service doubted a petite, 4’10” woman, with two dependent children, could handle the job – and a tough job it was. Every day, Kate would row her children to school, record the weather in the logbook, polish the brass, and clean the lens. At night, she would wind up the weights multiple times to keep the fourth-order lens rotating, trim the wicks, refill the oil reservoir, and in times of fog, she would have to start up the engine in the basement to power the fog signal. 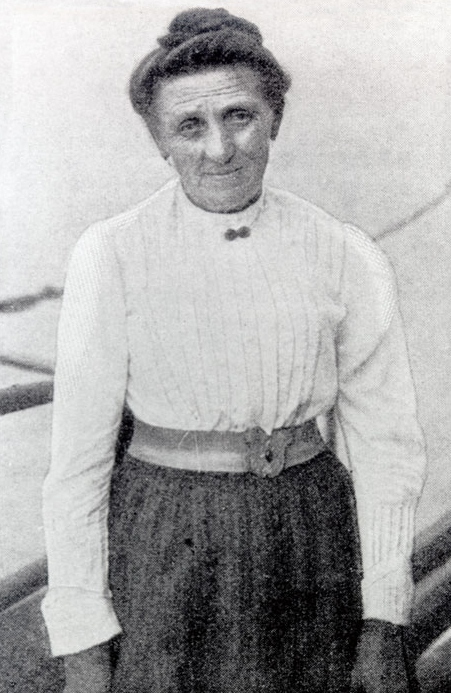 As her son Jacob matured, he started to help with the tasks and was made an official assistant in 1896. After several years, Kate was more at home in the lighthouse than on land, and she was well acquainted with her nearest neighbors, the boats that frequently passed by her kitchen window. Recalling a trip she had made to New York City, Kate stated, “I am in fear from the time I leave the ferryboat. The street cars bewilder me and I am afraid of automobiles. Why, a fortune wouldn’t tempt me to get into one of those things!” Upon hearing the noon whistle sound at a factory during one of her trips to the big city, she remarked, “If I hadn't known that the Richard B. Morse had been scrapped many years ago, I would have said that was that ship’s whistle.” Kate had a good ear, as it was later determined that the whistle was indeed from the Morse. After a scrap dealer purchased the ship, the whistle was salvaged and sold to the factory. 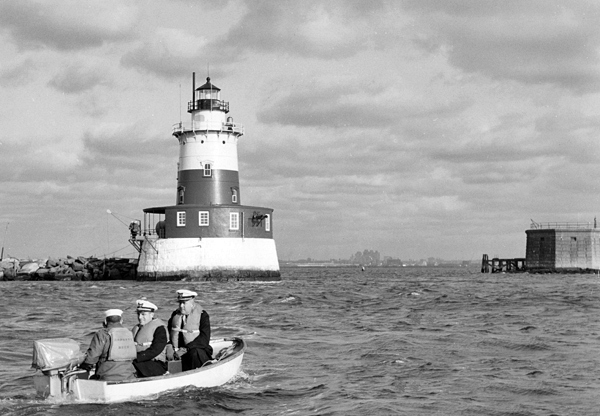 When the Coast Guard assumed responsibility for Robbins Reef Lighthouse in 1939, a three-man crew lived in the lighthouse to perform the duties that not too many years prior had been carried out by the diminutive Kate Walker. In tribute to the heroic service offered by lighthouse keepers, each vessel in the Coast Guard’s fleet of fourteen, 175-foot Keeper Class Buoy Tenders is named after a keeper. The KATHERINE WALKER (WLM 552) was launched on September 14, 1996, and appropriately, its homeport is in Bayonne, New Jersey, within sight of Robbins Reef Lighthouse. 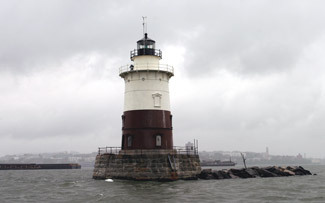 In 2009, Robbins Reef Lighthouse, deemed excess by the Coast Guard, was offered at no cost to eligible entities, including federal, state, and local agencies, non-profit corporations, and educational organizations under the provisions of the National Historic Lighthouse Preservation Act of 2000. Three groups expressed interest in the lighthouse, but only The Noble Maritime Collection submitted a full proposal. The Park Service recommended that the lighthouse be transferred to the museum, which has plans, over the course of the next ten years, to turn the tower’s lower level into a museum for tourists and school groups. Erin Urban, the Collection’s executive director, stated, “We’ll open the first floor as a replica of Katie Walker’s quarters when she lived there. And the other two floors we will rent out as a bed-and-breakfast.” The official transfer of the lighthouse took place in 2011. Head: Isaac Johnson (1839 – 1841), Michael M. Marsack (1841 – 1846), Thomas Carey (1846 – 1849), Richard M. Cary (1849 – 1852), John Taylor (1852 – 1853), Charles G. Clarke (1853 – 1861), G. F. Brinley (1861), Jason M. Smith (1861 – 1862), Charles G. Clarke (1862 – 1864), Garnet Tyson (1864 – 1868), E.D. Clark (1868 – 1869), David Carson (1869 – 1874), Hugh Walsh (1874 – 1877), Andrew A. Watts (1877), Joseph Geber (1877 – 1883), C.A. Blydenburg (1883 – 1885), John Walker (1885 – 1890), David D. Decker (1890), Christian Hansen (1890), Kate Walker (1890 – 1919), Jacob Walker (1919 – ), Frank K. Niblett (at least 1920 – at least 1921), Harry C. Bell (at least 1925), Adelard Bussiere (1926 – 1943), Roger H. Green (1943 – ), Ralph W. Rexinger (at least 1945), Lawrence N. Byrne (1947 –). First Assistant: Jacob Walker (1896 – 1919), Stephen A. Prier (1919 – at least 1920), John A. Miller (at least 1921), Arthur W. Blish (at least 1925), Marius Larson (at least 1930), William H. Bailey (at least 1935 – at least 1940). Second Assistant: Harry T. Moore (at least 1940). 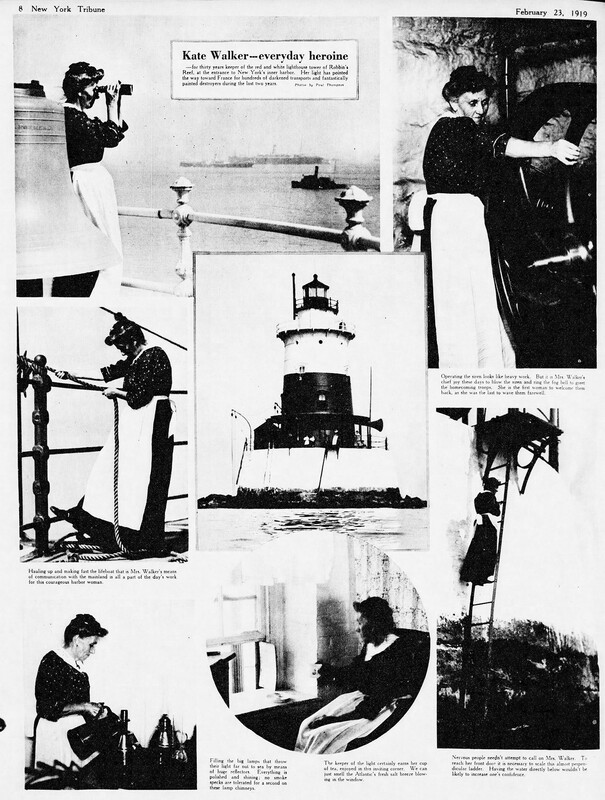 “Annual Report of the Lighthouse Board, various years. “Mind the Light, Katie,” Cliff Gallant, The Keeper's Log, Spring 1987. Women Who Kept the Lights, Mary Louise Clifford and J. Candace Clifford, 1993. 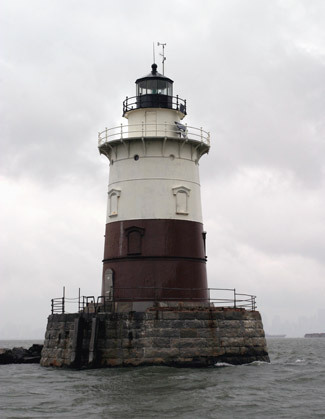 “Staten Island museum expected to be granted ownership of Robbins Reef Light Station,” John M. Annese, silive.com. 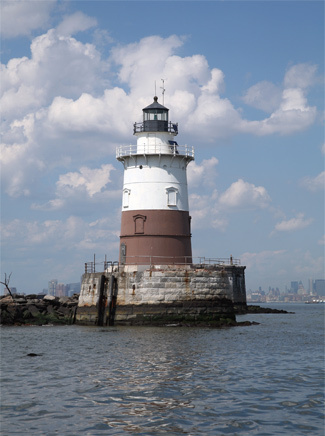 Located in New York Harbor just off the northern tip of Staten Island. 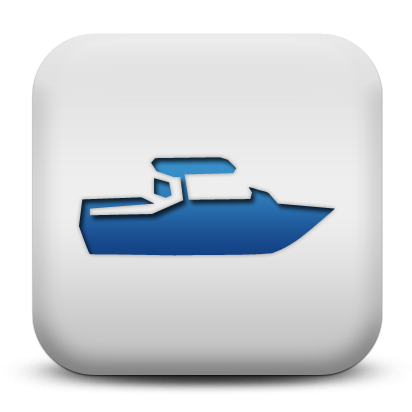 For a larger map of Robbins Reef Lighthouse, click the lighthouse in the above map. 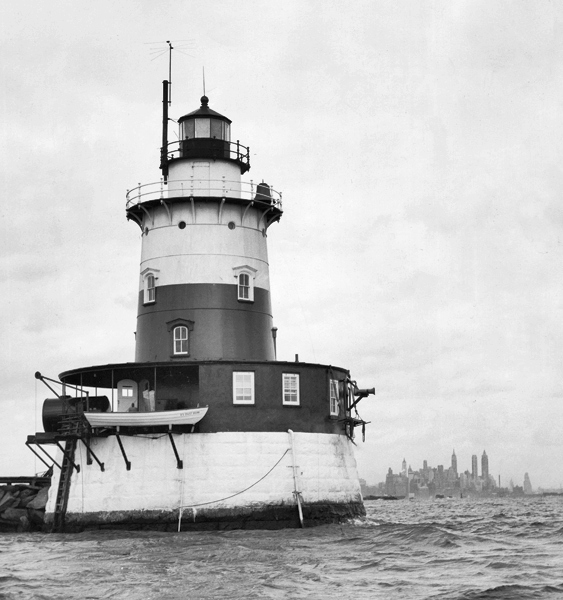 Robbins Reef Lighthouse can be seen for free from the Staten Island Ferry. The ferry departs from the Whitehall Terminal at Whitehall Street and South Street in Lower Manhattan and from the St. George Ferry Terminal at Richmond Terrace on Staten Island. The lighthouse is owned by The Noble Maritime Collection. Tower closed.